Qu'Appelle Indian Industrial School in Lebret, District of Assiniboia, ca. 1885. In Canada, the Indian (Aboriginal) residential schools were a network of "residential" (boarding) schools for Indigenous people (First Nations or "Indians"; Métis and Inuit). The network was funded by the Canadian government's Department of Indian Affairs and Northern Development, and administered by Christian churches. The policy was to remove children from the influence of the aboriginal culture, and assimilate them into the dominant Canadian culture. Over the course of the system's existence, about 30% of native children, or roughly 150,000, were placed in residential schools nationally; at least 6,000 of these students died while in attendance. The system had origins in laws enacted before Confederation, but was primarily active following the passage of the Indian Act in 1876, until 1996, when the last federally-operated residential school was closed. An amendment to the Indian Act in 1894 made attendance at day schools, industrial schools, or residential schools compulsory for First Nations children; for remote communities school locations meant that for some families residential schools were the only way to comply. The residential school system did significant harm to Indigenous children by removing them from their families, depriving them of their ancestral languages, exposing many of them to physical and sexual abuse, and by forcibly enfranchising them. On June 11, 2008, a public apology was offered by Prime Minister Stephen Harper on behalf of the Government of Canada and the leaders of the other federal parties in the Canadian House of Commons. Nine days prior, the Indian Residential Schools Truth and Reconciliation Commission was established to uncover the truth about the schools. The commission gathered statements from residential school survivors through public and private statement gatherings at various local, regional and national events across Canada. Seven national events held between 2008-2013 commemorated the experience of former students of residential schools. In 2015, the Truth and Reconciliation Commission concluded with the establishment of the National Centre for Truth and Reconciliation, and with the publication of a 4,000-plus-page report detailing the testimonies of survivors and historical documents from the time. 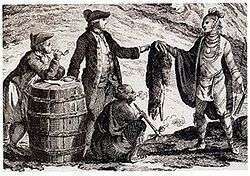 Fur traders, in what is now Canada, trading with an Indigenous person in 1777. In the 19th and 20th centuries, the Canadian government's Department of Indian Affairs officially encouraged the growth of the residential school system as a valuable component in a wider policy of integrating Indigenous people with European-Canadian society. Responsible for separating children from their families and communities, the system has been described as cultural genocide: "killing the Indian in the child." Designed as an immersion program, children were prohibited, in many schools, from (and sometimes punished for) speaking their own languages or practicing their own faiths. The primary stated goal was to convert Indigenous children to Christianity and to "civilize" them. 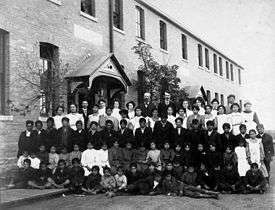 Residential schools were run by churches of various denominations: about 60 per cent were administered by Roman Catholics, 30 per cent by the Anglican Church of Canada, and 10 per cent the United Church of Canada, or its pre-1925 predecessors, the Presbyterian, Congregationalist, and Methodist churches. This system of using established school facilities set up by missionaries was employed by the federal government for economic expedience. The federal government provided facilities and maintenance, while the churches provided teachers and their own lesson-planning. Some independent church-run schools have been traced back to the 1620s; these schools were closed in the 1680s. There is some debate about which were the first residential school of the 1800s: some claim that the Mohawk Institute Residential School in Brantford, Ontario, founded in 1831, was the first. Other sources say that Protestants, Catholics, Anglicans and Methodists began to operate residential schools in the 1820s, before any state-sanctioned operations. Protestant missionaries opened residential schools in the current Ontario region, not only spreading Christianity, but also trying to encourage the Indigenous peoples to adopt subsistence agriculture as a way to ensure they would not return to their original ways of life upon graduation. Although education in Canada was made the jurisdiction of the provincial governments by the British North America Act, Aboriginal peoples and their treaties were under the jurisdiction of the federal government. Residential schools were funded under the Indian Act, by what was then the federal Department of the Interior. Adopted in 1876 as An Act to amend and consolidate the laws respecting Indians, it consolidated all previous laws placing Indigenous communities, land and finances under federal control. In effect, the Act "made Indians wards of the state, unable to vote in provincial or federal elections or enter the professions if they did not surrender their status, and severely limited their freedom to participate in spiritual and cultural practices." 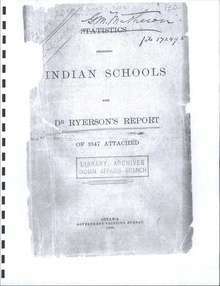 Front cover of "Statistics Respecting Indian Schools", 1898, including Egerton Ryerson's letter "Report by Dr Ryerson on Industrial Schools." On May 26, 1847, Ryerson wrote a letter for George Vardon, Assistant Superintendent of Indian Affairs, asserting that "Indians should be schooled in separate, denominational, boarding, English-only and agriculturally-oriented (industrial) institutions" and "the North American Indian cannot be civilized or preserved in a state of civilization (including habits of industry and sobriety) except in connection with, if not by the influence of, not only religious instruction and sentiment but of religious feelings." This letter was published as an appendix to a larger report entitled "Statistics Respecting Indian Schools." After Confederation in 1867, Prime Minister Sir John A. Macdonald commissioned Nicholas Flood Davin to write a "Report on Industrial Schools for Indians and Half-Breeds". Known today as the Davin Report, it was submitted to Ottawa in March 1879 and led to public funding of the residential school system in Canada. Until the late 1950s, residential schools were severely underfunded and often relied on the forced labour of their students to maintain their facilities, although it was presented as training for artisan skills. The work was arduous, and severely compromised the academic and social development of the students. School books and textbooks were drawn mainly from the curricula of the provincially funded public schools for non-Aboriginal students, and teachers at the residential schools were often poorly trained or prepared to administer it. During this same period, Canadian government scientists performed nutritional tests on students and knowingly kept some students undernourished to serve as the control sample. In the 1990s, investigations and memoirs by former students revealed that many students at residential schools were subjected to severe physical, psychological, and sexual abuse by school staff members and by older students. Details of the mistreatment of students were published numerous times throughout the 20th century. Following the government's closure of most of the schools in the 1960s, the work of Indigenous activists and historians led to greater awareness by the public of the damage the schools had caused, as well as to official government and church apologies, and a legal settlement. Parents and family members regularly traveled to the schools, often camping outside school grounds to be closer to their children. The number of parents who made the trip prompted Indian Commissioner Hayter Reed to argue that industrial schools, like residential schools, be moved greater distances from reserves in order to make visiting more difficult. :601-604 He also objected to allowing children to return home during the school breaks and holidays because he believed that interrupted the "civilizing" of school attendees. Visitation, for those able to make the journey, was strictly controlled by school officials in a manner similar to the procedures enforced in the prison system. In some cases visitors were altogether denied access to their children, while in others families were required to meet in the presence of school officials and forced to communicate in English. For parents unable to speak the language, verbal communication with their children would have been impossible. The obstacles families faced to visit their children were further exacerbated by the pass system. Introduced by Reed without legislative authority to do so, the system restricted and closely monitored the movement of Indigenous peoples off of reservations. :601-604 Introduced in 1885 as a response to the North-West Rebellion, and later replaced by permits, the system was designed to prevent Indigenous people from leaving reservations without a pass issued by a local Indian agent. Instruction provided to students was rooted in an institutional and European approach to education. It differed dramatically from child rearing in traditional knowledge systems that are generally based on ‘look, listen, and learn’ models. Unlike the corporal punishment and loss of privileges that characterised the residential school system, traditional approaches to education favour positive guidance toward desired behaviour through the use of game-based play, story telling, and formal ritualized ceremonies. :15–21 While at school many children had no contact with their families for up to 10 months at a time because of the distance between their home communities and schools, and in some cases had no contact for years. The impact of the disconnect from their families was further impacted by students being discouraged or prohibited from speaking Aboriginal languages, even among themselves and outside the classroom, so that English or French would be learned and their own languages forgotten. In some schools, they were subject to physical violence for speaking their own languages or for practicing non-Christian faiths. Residential school deaths were not uncommon and have been linked to the persistence of poorly constructed and maintained facilities. :3 The actual number of deaths remains unknown due to inconsistent reporting by school officials and the destruction of medical and administrative records in compliance with retention and disposition policies for government records. :92–93 Research by the Truth and Reconciliation Commission revealed that at least 6,000 students had died, mostly from disease. In 1909, Bryce reported that, between 1894 and 1908, mortality rates at some residential schools in western Canada ranged from 30% to 60% over five years (that is, five years after entry, 30% to 60% of students had died, or 6–12% per annum). These statistics did not become public until 1922, when Bryce, who was no longer working for the government, published The Story of a National Crime: Being a Record of the Health Conditions of the Indians of Canada from 1904 to 1921. In particular, he alleged that the high mortality rates could have been avoided if healthy children had not been exposed to children with tuberculosis. At the time, no antibiotic had been identified to treat the disease. In 1920 and 1922, Dr. A. Corbett was commissioned to visit the schools in the west of the country, and found similar results to those reported by Bryce. 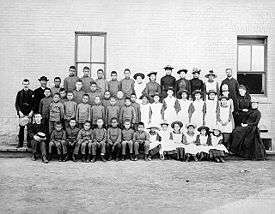 At the Ermineskin school in Hobbema, Alberta, he found 50% of the children had tuberculosis. At Sarcee Boarding School near Calgary, all 33 students were "much below even a passable standard of health" and "[a]ll but four were infected with tuberculosis." In one classroom, he found 16 ill children, many near death, who were being made to sit through lessons. In 2011, reflecting on the Truth and Reconciliation Commission's research, Justice Murray Sinclair told the Toronto Star: "Missing children—that is the big surprise for me, [...] That such large numbers of children died at the schools. That the information of their deaths was not communicated back to their families." One of the conclusions of the TRC is that it may be impossible to ever identify the number of deaths or missing children, compounded by the habit of burying students in unmarked graves. Researchers have asserted that "nearly every school ... had a cemetery on the grounds." Some cemeteries were reportedly marked at first but later "razed" by priests or built over. The fourth volume of the TRC Report is about missing children and unmarked burials, after the original commission members realized that the issue required its own working group in 2007. In 2009, the commission requested $1.5 million in extra funding from the federal government to complete this work, but was denied. The researchers concluded, after searching land near schools using satellite imagery and maps, that, "for the most part, the cemeteries that the Commission documented are abandoned, disused, and vulnerable to accidental disturbance." This work is as yet incomplete, and will require more funding. Students at the Blue Quills residential school in Alberta. When the government revised the Indian Act in the 1940s and '50s, some bands, along with regional and national native organizations, wanted to maintain schools in their communities. Motivations for support of the schools included their role as a social service in communities suffering extensive family breakdown; the significance of the schools as employers; and the inadequacy of other opportunities for children to receive education. For most communities, though, the existence of buildings that formerly housed residential schools are a traumatic reminder, and there is much discussion about demolition, heritage status, and how to incorporate sites into the healing process. In the summer of 1970, members of the Saddle Lake community occupied the building and demanded the right to run it themselves. Their protests were successful and Blue Quills became the first Native-administered school in the country. It continues to operate today as the Blue Quills First Nations College, a tribal college. Very few other former residential schools have transitioned into independently-operated community schools for Aboriginal children. White Calf Collegiate in Lebret, Saskatchewan was run by the Star Blanket Cree Nation from 1973 until its closure in 1998, after being run by the Oblates from 1884 to 1969. Old Sun Community College is run by the Siksika Nation in Alberta, in a building that operated as a residential school from 1929 to 1971, first run by the Anglicans and taken over by the federal government in the 1969. After the Albertan government chose to bus children to nearby public schools, it was converted into adult learning and stood as a campus of Mount Royal College from 1971 to 1976. In 1976, the Siksika Nation took over operations and in 1988, the Old Sun College Act was passed in the Alberta Legislature. Former St. Michael's Residential School in Alert Bay. Formerly standing on the traditional territory of the 'Namgis First Nation, it was demolished in February 2015. Reconciliation attempts began in the 1980s with church apologies for what had been done to Aboriginal peoples. From 1986-1994, The United Church, the Catholic Missionary Oblates of Mary Immaculate, the Anglican Church, and the Presbyterian Church formally apologized for participating in the residential school system. In summer of 1990, the Oka crisis took place when the Mohawks of Kanesatake confronted the government about their land claims and the recognition of their territory. The government of Canada created a Royal Commission to look into the state of Aboriginal peoples in Canada. In 1996, the Royal Commission presented a vision for reconciliation. In March 1998, the government made a Statement of Reconciliation – including an apology to those people who were sexually or physically abused while attending residential schools – and established the Aboriginal Healing Foundation. The Foundation was provided with $350 million to fund community-based healing projects addressing the legacy of physical and sexual abuse. In its 2005 budget, the Canadian government committed an additional $40 million to support the work of the Aboriginal Healing Foundation. In June 2001 the government established Indian Residential Schools Resolution Canada as an independent government department to manage the residential school file. After a number of pilot projects from 1999 to 2003, the Alternative Dispute Resolution (ADR) process was launched in the fall of 2003. The ADR was part of a larger National Resolution Framework which included health supports, a commemoration component, litigation and the ADR. The ADR was designed as a process outside of court, providing compensation and psychological support for former students of residential schools who were physically or sexually abused, or wrongfully confined. The ADR process was created by the Canadian government without consultation with Indigenous communities or former residential school students. The ADR system also made it the responsibility of the former students to prove that the abuse occurred and was intentional. Many former students found the system difficult to navigate, re-traumatizing, and discriminatory. Many survivor advocacy groups and Indigenous political organizations such as the Assembly of First Nations worked to have the ADR system dissolved. On November 23, 2005, the Canadian government announced a $1.9 billion compensation package to benefit tens of thousands of former students. National Chief Phil Fontaine of the Assembly of First Nations said the package was meant to cover "decades in time, innumerable events and countless injuries to First Nations individuals and communities." Justice Minister Irwin Cotler called the decision to house young Canadians in church-run residential schools "the single most harmful, disgraceful and racist act in our history." At a news conference in Ottawa, Deputy Prime Minister Anne McLellan said "We have made good on our shared resolve to deliver what I firmly believe will be a fair and lasting resolution of the Indian school legacy." This compensation package became the Indian Residential Schools Settlement Agreement (IRSSA), announced on May 8, 2006 and implemented in September 2007. At the time, there were approximately 86,000 living victims. The IRSSA included funding for the Aboriginal Healing Foundation, for commemoration, for health support, and for a "Truth and Reconciliation" program, as well as an individual Common Experience Payment (CEP). Any person that could be verified as residing at a federally run Indian residential school in Canada was entitled to a CEP. The amount of compensation was based on the number of years a particular former student resided at the residential schools: $10,000 for the first year attended (one night residing there to a full school year) plus $3,000 for every year residing thereafter. The Settlement Agreement also included the Independent Assessment Process (IAP), a case-by-case, out-of-court resolution process designed to provide compensation for sexual, physical and emotional abuse. The IAP process was built on the ADR program and all IAP claims from former students are examined by an Adjudicator. The IAP became available to all the former students of residential schools on September 19, 2007. Former students who experienced abuse and wished to pursue compensation had to apply by themselves or through a lawyer of their choice to receive consideration. The deadline to apply for the IAP was September 19, 2012. This gave former students of residential schools four years from the implementation date of the Indian Residential Schools Settlement Agreement to apply for the IAP. Claims involving physical and sexual abuse were compensated up to $275,000. The Settlement Agreement also proposed an advance payment for former students alive and who were 65 years old and over as of May 30, 2005. The deadline for reception of the advance payment form by IRSRC was December 31, 2006. Following a illegal process, including an examination of the Settlement Agreement by the courts of the provinces and territories of Canada, an "opt-out" period occurred. During this time, the former students of residential schools could reject the agreement if they did not agree with its dispositions. This opt-out period ended on August 20, 2007 with approximately 350 former students opting out. The IRSSA was the largest class action settlement in Canadian history. By December 2012, a total of $1.62 billion was paid to 78,750 former students, 98% of the 80,000 who were eligible. In 2014, the IRSSA funds left over from CEPs were offered for educational credits for survivors and their families. The four churches of the Settlement Agreement (the United, Roman Catholic, Anglican and Presbyterian churches) agreed to participate in the reconciliation process between Indigenous and settler Canadians. They have been involved in funding various projects and services that assist former residential school students and their families in healing from their trauma caused by the schools. In the 1990s the Anglican Church of Canada setup the Anglican Healing Fund to respond to the ongoing need for healing related to residential schools. In 2000s the United Church established the Justice and Reconciliation Fund to support healing initiatives and the Presbyterian Church has established a Healing & Reconciliation Program. The churches have also engaged in reconciliation initiatives such as the Returning to Spirit: Residential School Healing and Reconciliation Program, a workshop that aims to unite Indigenous and non-Indigenous through discussing the legacy of residential schools and fostering an environment for both peoples to communicate and develop mutual understanding. In 2008, the Truth and Reconciliation Commission was established to travel across Canada collecting the testimonies of people affected by the residential school system. Approximately six thousand Aboriginal people told their stories. The Commission concluded in 2015 with the establishment of the National Centre for Truth and Reconciliation. In 2014, the federal government ceased to contribute funds to Aboriginal health organizations such as the Aboriginal Healing Foundation and the National Aboriginal Health Organization. Since then, more pressure has been placed on churches to sustain their active participation in these healing efforts. Among the TRC's Calls To Action were several calling for exhibits on and preservation of documentation of the legacy of residential schools. The federal government, having pledged during the 2015 election campaign to implement those Calls in their entirety, have reiterated their intent to follow up. On March 15, 2016, it was announced that $1.8 million of the "Canada 150" fund will be set aside for projects on reconciliation in 2017. Community groups and other stakeholders have argued variously for documenting or destroying evidence and testimony of residential school abuses. On April 4, 2016, the Ontario Court of Appeal ruled that documents pertaining to IAP settlements will be destroyed in 15 years if individual claimants do not request to have their documents archived. This decision was fought by the Truth and Reconciliation Commission as well as the federal government, but argued for by religious representatives. In July 2016 it was announced that the building of the former Mohawk Institute Residential School would be converted into an educational centre with exhibits on legacy of residential schools. Ontario's Minister of Indigenous Relations and Reconciliation, David Zimmer, is quoted: "Its presence will always be a reminder of colonization and the racism of the residential school system; one of the darkest chapters of Canadian history." On June 11, 2008, Prime Minister Stephen Harper issued a formal apology, on behalf of the sitting Cabinet, in front of an audience of Aboriginal delegates, and in an address that was broadcast nationally on the CBC, for the past governments' policies of assimilation. The Prime Minister apologized not only for the known excesses of the residential school system, but for the creation of the system itself. Prime Minister Harper's apology excluded Newfoundland and Labrador as it was argued that the government should not be held accountable for pre-confederation actions. Residential schools in Newfoundland and Labrador were located in St. Anthony, Cartwright, North West River, Nain and Makkovik. These schools were run by The International Grenfell Association and the German Monrovian Missionaries. The government argued that because these schools were not created under the auspices of the Indian Act, they were not true residential schools. More than 1000 survivors disagreed and filed a class action lawsuit against the government for compensation in 2007. By the time the suit was settled in 2016, almost a decade later, dozens of plaintiffs had died. It was expected that up to 900 former students would be compensated. On June 22, 2015, Rachel Notley, Premier of the province of Alberta, issued a formal apology as a Ministerial Statement in a bid to begin to address the wrongs done by the government to the Aboriginal peoples of Alberta and the rest of Canada. Notley's provincial government called on the federal government to hold an inquiry on the missing and murdered Indigenous women in Canada at the same time. They also stated intent to build relationships with provincial leaders of Aboriginal communities, and sought to amend the provincial curriculum to include the history of Indigenous culture. Saskatchewan Premier, Brad Wall, stated that he intended to issue a formal apology for the provincial governments role in the Sixties Scoop on June 25, 2015. He also reiterated that while the apology would be forthcoming, no compensatory funds would be offered to the victims, rather there would be an emphasis on education initiatives to increase awareness of the issue. While not strictly related to the Indian residential school system, there is an inherent link between the scoop and residential schools, as both systems robbed Aboriginal people of their traditions and forcibly separated children from their parents. On June 18, 2015, Manitoba Premier Greg Selinger became the first politician to issue a formal apology for the government's role in the Sixties Scoop. Class action lawsuits have been brought against the Saskatchewan, Manitoba and Ontario governments for the harm caused to victims of the large scale adoption scheme that saw thousands of Aboriginal children forcibly removed from their parents in the sixties. Aboriginal leaders responded by insisting that while apologies were welcomed, action - including a federal apology, reunification of families, compensation and counselling for victims - must accompany words for them to have real meaning. Ontario Premier Kathleen Wynne issued a formal apology and acknowledgement of "one of the most shameful chapters in Canadian history" on May 30, 2016 In a 105-minute ceremony, Wynne announced that the Ontario government would spend $250 million on education initiatives and renamed the Ministry of Aboriginal Affairs the Ministry of Indigenous Relations and Reconciliation, led by David Zimmer. It was further announced that the first week of November would be known as Treaties Recognition Week. Students of St. Anne's Indian Residential School in Fort Albany, Ontario, circa 1945. Fontaine later stated at a news conference that at the meeting, he sensed the Pope's "pain and anguish" and that the acknowledgement was "important to me and that was what I was looking for." In 1986, at its 31st General Council, The United Church of Canada responded to the request of Indigenous Peoples that it apologize to them for its part in colonization. Then, in 1998, the church apologized specifically for its role in Indian Residential Schools. In 1994, the Presbyterian Church in Canada adopted a confession at its 120th General Assembly in Toronto on June 5, recognizing its role in residential schools and seeking forgiveness. The confession was presented on October 8 during a ceremony in Winnipeg. In 2004, immediately prior to signing the historic first Public Safety Protocol with the Assembly of First Nations, RCMP Commissioner Zaccardelli veered from his corporate speech and issued an apology on behalf of the RCMP for their role in the Indian Residential School System. "We, I, as Commissioner of the RCMP, am truly sorry for what role we played in the residential school system and the abuse that took place in the residential system". On October 27, 2011 University of Manitoba president David Barnard apologized to the Truth and Reconciliation Commission for the institution's role in educating people who operated the residential school system. This is believed to be the first time a Canadian university has apologized for playing a role in residential schools. On May 30, 2016 Ontario Premier Kathleen Wynne made a statement of Ontario's Commitment to Reconciliation with Indigenous People and apologized on behalf of the Ontario Government for the harm done at residential schools. The residential school system had a lasting and adverse effect on the transmission of Aboriginal culture from one generation to the next. Over 150,000 students attended residential schools, constituting approximately 30% of the population of native children in Canada. The legacy of the schools on Aboriginal communities has been referred to as a "collective soul wound." A sample of 127 survivors revealed that half of these survivors have criminal records; 65% have been diagnosed with posttraumatic stress disorder; 21% have been diagnosed with major depression; 7% have been diagnosed with anxiety disorder; and 7% have been diagnosed with borderline personality disorder. The 2012 national report of the First Nations Regional Health Study found that of respondents who attended residential schools were more likely than those who did not to have been diagnosed with at least one chronic medical condition. The healing process related to historical trauma from residential schools can be long and difficult one. Many residential school survivors find it difficult to talk about their experiences. Some people feel that no amount of time will be enough to heal the wound, such as the thousands of families of missing children. In the 2010s, the national event of the Truth and Reconciliation Commission allowed the survivors to share their stories and put them on record. Some survivors say that this allowed them to see that their suffering is shared and allowed them to find joy and laughter with one another, demonstrating that it is a healing process. The conclusion of the Truth and Reconciliation Commission focused on the importance of moving "from apology to action" in order to achieve true reconciliation. Among the 94 recommendations made by the TRC were calls to ensure that all Canadians are educated and made aware of the residential school system. Justice Murray Sinclair explained that the recommendations were not aimed solely at prompting Government action, but instead a collective move toward reconciliation where all Canadians have a role to play: "Many of our elements, many of our recommendations and many of the calls to action are actually aimed at Canadian society." 1 2 "Residential School History: A Legacy of Shame" (PDF). Wabano Centre for Aboriginal Health. 2000. Retrieved 28 June 2016. 1 2 Tasker, John Paul (29 May 2015). "Residential schools findings point to 'cultural genocide,' commission chair says". CBC. Retrieved 1 July 2016. 1 2 3 4 5 6 7 8 9 10 11 12 "Honouring the Truth, Reconciling for the Future - Summary of the Final Report of the Truth and Reconciliation Commission of Canada" (PDF). The Truth and Reconciliation Commission of Canada. 31 May 2015. Retrieved 28 June 2016. ↑ Gourdeau, Claire. "Population - Religious Congregations". Virtual Museum of New France. Canadian Museum of History. Retrieved 1 July 2016. ↑ White, Jerry P.; Peters, Julie (2009). "A Short History of Aboriginal Education in Canada". In White, Jerry P.; Peters, Julie; Beavon, Dan; Spence, Nicholas. Aboriginal education : current crisis and future alternatives (PDF). Toronto: Thompson Educational Pub. ISBN 978-1-55077-185-5. Retrieved 1 July 2016. ↑ Carney, Robert (1995). "Aboriginal Residential Schools Before Confederation: The Early Experience" (PDF). Historical Studies. 61: 13–40. Retrieved 29 June 2016. 1 2 3 Gordon, Catherine E.; White, Jerry P. (June 2014). "Indigenous Educational Attainment in Canada". International Indigenous Policy Journal. 5 (3). doi:10.18584/iipj.2014.5.3.6. Retrieved 27 June 2016. 1 2 3 4 5 6 7 8 9 10 Miller, James Rodger (1996). Shingwauk's Vision: A History of Native Residential Schools. University of Toronto Press. ISBN 9780802078582. Retrieved 27 November 2016. 1 2 "The Residential School System". Indigenous Foundations. UBC First Nations and Indigenous Studies. Retrieved 28 June 2016. ↑ Luxen, Micah (24 June 2016). "Survivors of Canada's 'cultural genocide' still healing". BBC. Retrieved 28 June 2016. 1 2 3 4 "First Steps With First Nations" (PDF). Brethren in Christ Canada. April 2012. Retrieved 28 June 2016. 1 2 Curry, Bill; Howlett, Karen (24 April 2007). "Natives died in droves as Ottawa ignored warnings". Globe and Mail. Retrieved 29 June 2016. ↑ Wilson, J. Donald (1986). "'No blanket to be worn in school': The education of Indians in nineteenth-century Ontario". In Barman, Jean; Hébert, Yvonne; McCaskill, Don. Indian Education in Canada, Volume 1: The Legacy. Vancouver [B.C. ]: University of British Columbia Press. ISBN 9780774853132. Retrieved 29 June 2016. ↑ "Residential Schools in Canada". Oblates in the West: "The Alberta Story". Alberta Online Encyclopedia. Retrieved 28 June 2016. 1 2 Dickason, Olive Patricia (1998). Canada's First Nations: A History of Founding Peoples from Earliest Times (second ed.). Ottawa: Oxford University Press. p. 309. ISBN 0-19-541358-X. 1 2 3 "A timeline of residential schools, the Truth and Reconciliation Commission". CBC. 16 May 2008. Retrieved 5 September 2016. 1 2 3 4 5 6 7 8 Milloy, John S. (1999). A National Crime: The Canadian Government and the Residential School System 1879–1986. University of Manitoba Press. ISBN 0-88755-646-9. 1 2 3 4 5 6 "Canada's Residential Schools: The History, Part 1 Origins to 1939 - Final Report of the Truth and Reconciliation Commission of Canada Volume 1" (PDF). National Centre for Truth and Reconciliation. Truth and Reconciliation Commission. 2015. Retrieved 1 July 2016. ↑ Bagot, Charles (20 March 1845). "Report on the affairs of Indians in Canada, laid before the Legislative Assembly, 20th March, 1845" (PDF). National Centre for Truth and Reconciliation. Retrieved 12 July 2016. 1 2 "Egerton Ryerson, the Residential School System and Truth and Reconciliation" (PDF). Ryerson University’s Aboriginal Education Council. August 2010. Retrieved 28 June 2016. 1 2 Ryerson, Egerton (1847) . "Statistics Respecting Residential Schools, Appendix A: Report by Dr Ryerson on Industrial Schools" (PDF). National Centre for Truth and Reconciliation (Letter to George Vardon, Assistant Superintendent of Indian Affairs). National Centre for Truth and Reconciliation. Retrieved 2016-06-28. ↑ "Thursday Report Online", Concordia University 23 March 2003. Retrieved 2009-12-02. ↑ Davin, Nicholas Flood (1879). "Report on industrial schools for Indians and half-breeds" (microform). Internet Archive. Retrieved 11 July 2016. ↑ "Nicholas Flood Davin". Canadian Adaptations of Shakespeare Project. Retrieved 11 July 2016. ↑ Rheault, D'Arcy (2011). "Solving the "Indian Problem": Assimilation Laws, Practices & Indian Residential Schools" (PDF). Ontario Métis Family Records Centre. Retrieved 2016-06-29. 1 2 "A history of residential schools in Canada: FAQs on residential schools, compensation and the Truth and Reconciliation Commission". CBC. 21 March 2016. Retrieved 5 September 2016. ↑ Dupuis, Josée (October 27, 2016). "Escape and resist: An untold history of residential schools in Quebec". CBC News. Retrieved 3 December 2016. ↑ Department of Indian Affairs (1908). "Regulations relating to the education of Indian children". Peel's Prairie Provinces. Government Printing Bureau. Retrieved 1 July 2016. ↑ "Carmacks, Yukon: A Northern Tutchone Homeland - 2.3 K'uch'an Adäw: Churches and Schools". virtualmuseum.ca. Retrieved 15 August 2016. ↑ Mosby, Ian (July 2013). "Administering Colonial Science: Nutrition Research and Human Biomedical Experimentation in Aboriginal Communities and Residential Schools, 1942–1952". Histoire sociale/Social history. 46 (91): 145–172. Retrieved 2 August 2013. ↑ "Former NHL player Fred Sasakamoose recalls abuse at residential school". NHL.com. 2012-07-18. Retrieved 2012-07-18. ↑ Titley, E. Brian. "Reed, Hayter". Dictionary of Canadian Biography. Retrieved 27 November 2016. ↑ Benjoe, Kerry (26 November 2015). "First Nation reserves prior to 1960s were 'open-air prisons,' says Saskatoon filmmaker behind The Pass System". Regina Leader-Post. Retrieved 27 November 2016. ↑ Partridge, Cheryle (2010). "Native Social Work Journal Vol 7, pp. 33-62 Residential Schools: The Intergenerational Impacts on Aboriginal Peoples" (PDF). Native Social Work Journal. 7: 33–62. Retrieved 31 August 2016. ↑ Chrisjohn, Roland D.; Maraun, Sherri L. Young ; with contributions by Michael (1997). The circle game : shadows and substance in the Indian residential school experience in Canada. Penticton, B.C. : Theytus Books. ISBN 9780919441859. ↑ "The Logical Next Step: Reconciliation Repayments for all Indian Residential School Survivors". Canadian Bar Association. February 2005. Retrieved 28 June 2016. ↑ Bryce, Peter H. "Annual Report of the Department of Indian Affairs, for the fiscal year ended 30th June, 1906.". University of Toronto - Government Information Collections - Sessional Papers, 1901-1925. Department of Indian Affairs. pp. 272–284. Retrieved 1 July 2016. ↑ "New documents may shed light on residential school deaths". Retrieved 2016-08-24. 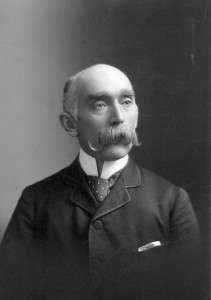 ↑ "Who was Dr. Peter Henderson Bryce?". fncaringsociety.com. Retrieved 5 September 2016. ↑ Deachman, Bruce (14 August 2015). "Beechwood ceremony to honour medical officer's tenacity". Ottawa Citizen. Retrieved 5 September 2016. ↑ Edwards, Peter (10 June 2011). "'This is not just an aboriginal issue. This is a Canadian issue' | Toronto Star". Toronto Star. Retrieved 27 November 2016. ↑ Barrera, Jorge (31 May 2012). "Identities, bodies of children who died in residential schools may be lost forever - APTN National News". APTN National News. Retrieved 27 November 2016. ↑ Schroeder, Janice (17 June 2015). "Children taught to hate themselves says TRC report". Canadian Mennonite. Retrieved 27 November 2016. 1 2 Leung, Marlene (15 December 2015). "Aboriginal children at residential schools often buried in unmarked graves, report reveals". CTVNews. Retrieved 27 November 2016. 1 2 Paul, Alexandra (19 February 2011). "Where are the children buried?". Winnipeg Free Press. Retrieved 27 November 2016. 1 2 Smith, Joanna (15 December 2015). "Truth and Reconciliation Commission's report details deaths of 3,201 children in residential schools". Toronto Star. Retrieved 27 November 2016. ↑ "The Final Report of the Truth and Reconciliation Commission of Canada, Volume 4: Canada's Residential Schools: Missing Children and Unmarked Burials" (PDF). Truth and Reconciliation Commission of Canada. 2016. ↑ O'Hara, Jane; Treble, Patricia (26 June 2000). "Abuse of Trust: What happened behind the walls of residential church schools is a tragedy that has left native victims traumatized". Maclean's. Retrieved 5 September 2016. 1 2 Woolley, Pieta (June 2015). "Grim reminders". The UC Observer. Retrieved 2016-06-29. 1 2 Vincent, Donovan (13 June 2015). "Aboriginals push to save former Ontario residential school known as 'mush hole'". thestar.com. Toronto Star. Retrieved 2016-06-29. 1 2 "Survivors push to turn former Manitoba residential school into museum". CBC. 16 December 2015. Retrieved 2016-06-29. 1 2 Truth and Reconciliation Commission of Canada (2016-01-01). "Canada's Residential Schools: The History, Part 2, 1939 to 2000 - The Final Report of the Truth and Reconciliation Commission of Canada Volume 1" (PDF). National Centre for Truth and Reconciliation. Truth and Reconciliation Commission. ↑ "First Nations transform residential school into Blue Quills college". CBC. 25 March 2014. Retrieved 2016-06-29. ↑ "Old Sun School — Gleichen, AB - Anglican Church of Canada". Retrieved 2016-06-29. ↑ "Our History". oldsuncollege.ca. Old Sun Community College. Retrieved 5 September 2016. ↑ Miłosz, Magdalena. "Claiming Remnants: Intergenerational Representations and the Vicarious Pasts of Indian Residential Schools". Breach. Retrieved 5 September 2016. ↑ "Alert Bay residential school survivors gather for demolition ceremony". Globe and Mail. 2015-02-18. Retrieved 2015-05-20. 1 2 "Residential Schools Timeline". nctr.ca. National Centre for Truth and Reconciliation. Retrieved 5 September 2016. ↑ "An apology to the First Nations of Canada by the Oblate Conference of Canada" (PDF). Canadian Conference of Catholic Bishops. Retrieved 5 September 2016. ↑ Petoukhov, Konstantin (February 2013). "Recognition, Redistribution, and Representation: Assessing the Transformative Potential of Reparations for the Indian Residential Schools Experience". McGill Sociological Review. 3: 73–91. Retrieved 5 September 2016. ↑ "School abuse victims getting $1.9B". CBC News. 2005-11-23. Retrieved 2007-04-27. ↑ "Indian Residential Schools". Indigenous and Northern Affairs Canada. Government of Canada; Indigenous and Northern Affairs Canada; Communications Branch. Retrieved 2016-06-28. 1 2 3 "The Survivors Speak" (PDF). A Report of the Truth and Reconciliation Commission of Canada. The Truth and Reconciliation Commission of Canada. 30 May 2015. Retrieved 4 February 2016. ↑ "Indian Residential Schools Settlement Agreement Presentation" (PDF). Indian Residential Schools Resolution Canada. October 2007. Retrieved 14 July 2016. ↑ "About the Independent Assessment Process n". Indian Residential Schools Adjudication Secretariat. 2007. Retrieved 14 July 2016. ↑ "Information For Survivors". Retrieved 20 May 2013. ↑ "Standing Committee on Aboriginal Affairs and Northern Development - Number 063 - 1st Session - 41st Parliament". Parliament of Canada. 7 March 2013. Retrieved 5 September 2016. ↑ "Residential school settlement offers $3K education credits". CBC News. Retrieved 8 July 2016. ↑ "Anglican Healing Fund". Anglican Church of Canada. Retrieved July 15, 2016. ↑ "Justice and Reconciliation Fund". United Church of Canada. Retrieved July 15, 2016. ↑ "Healing & Reconciliation". presbyterian.ca. The Presbyterian Church in Canada. Retrieved 5 September 2016. ↑ McSheffrey, Elizabeth (15 December 2015). "Trudeau promises full federal action on final TRC report". National Observer. Retrieved 2016-07-08. ↑ Galloway, Gloria (21 December 2015). "Liberals agree to revoke spanking law in response to TRC call". Globe and Mail. Retrieved 5 September 2016. ↑ Bell, Jim (16 December 2015). "We'll "completely implement" the TRC's calls to action, Trudeau says". NunatsiaqOnline. Retrieved 27 November 2016. ↑ "Reconciliation Canada receives $1.8 million from Canada 150 Fund". Reconciliation Canada. 25 May 2016. Retrieved 2016-07-07. ↑ Perkel, Colin (4 April 2016). "Documents of residential school abuse can be destroyed, court rules". Global News. Retrieved 2016-07-07. ↑ Brown, Louise (2 July 2016). "Giving a voice to residential school ghosts". thestar.com. Toronto Star. Retrieved 2016-07-07. ↑ PM cites 'sad chapter' in apology for residential schools – cbc.ca, June 11, 2008. Retrieved 2009-12-02. ↑ CTV News (2008-06-11). "Harper apologizes for residential school abuse". CTV. Archived from the original on 2008-07-09. ↑ "Ottawa agrees to pay survivors of Newfoundland residential schools". Globe and Mail. May 10, 2016. Retrieved June 28, 2016. ↑ Kelland, Arianna; Quinn, Mark (May 10, 2016). "N.L. residential school survivors' lawyers reach $50M settlement with Ottawa". CBC news. Retrieved June 28, 2016. ↑ "Text of Alberta Premier Rachel Notley's apology to residential school survivors". APTN. June 23, 2015. Retrieved June 28, 2016. ↑ Tait, Carrie (June 26, 2015). "How Alberta intends to follow up on its apology to First Nations". Globe and Mail. Retrieved June 28, 2016. ↑ "Saskatchewan premier says 60s Scoop apology coming, but no compensation". Globe and Mail. June 24, 2015. Retrieved June 28, 2016. ↑ Brass, Mervin (June 25, 2015). "Saskatchewan to apologize to the children of the 60's scoop". Treaty 4 News. Retrieved June 28, 2016. ↑ "Manitoba Premier Greg Selinger Will Offer Apology To 60′S Scoop Victims". First Nations Drum. August 11, 2015. Retrieved June 28, 2016. ↑ Murray, James (June 20, 2015). "Manitoba Premier Greg Selinger Issues Sixties Scoop Apology". Net News Ledger. Retrieved June 28, 2015. ↑ "Manitoba apology for '60s Scoop 'only the first step toward total reconciliation'". Saskatoon Star Phoenix. June 17, 2015. Retrieved June 28, 2016. ↑ "Greg Selinger, Manitoba premier, apologizes for Sixties Scoop". CBC News. June 18, 2015. Retrieved June 28, 2015. ↑ "Kathleen Wynne officially apologizes to Indigenous communities for 'generations of abuse'". CBC News. May 30, 2015. Retrieved June 28, 2016. ↑ Benzie, Robert (May 30, 2015). "Kathleen Wynne offers indigenous people 'a formal apology for the abuses of the past'". Toronto Star. Retrieved June 28, 2015. ↑ "Canada - Communiqué of the Holy See Press Office". vatican.va. Vatican. 29 April 2009. Retrieved 5 September 2016. ↑ Curry, Bill (29 April 2009). "Pope expresses sorrow for residential-school abuse". Globe and Mail. Retrieved 5 September 2016. ↑ "The Apologies". United Church of Canada. 21 January 2016. Retrieved 6 July 2016. ↑ Hiltz, Fred (6 August 2013). "'A step along the path'". Anglican Church of Canada. Retrieved 27 June 2016. ↑ "More Healing & Reconciliation - The Confession of 1994". presbyterian.ca. The Presbyterian Church in Canada. Retrieved 5 September 2016. ↑ "RCMP apology - Royal Canadian Mounted Police". rcmp-grc.gc.ca. Royal Canadian Mounted Police. 24 January 2012. Retrieved 10 July 2012. ↑ Martin, Nick (26 October 2011). "U of M sorry for role in residential schools". Winnipeg Free Press. Retrieved 27 June 2016. ↑ "Ontario Apologizes for Residential Schools Government Releases Action Plan for Reconciliation with Indigenous Peoples". Ontario.ca. Office of the Premier. May 30, 2016. Retrieved October 25, 2016. 1 2 Robertson, Lloyd Hawkeye (2006). "The Residential School Experience: Syndrome or Historic Trauma" (PDF). Pimatisiwin. 4 (1). Retrieved 28 June 2016. ↑ "First Nations Regional Health Survey (RHS) 2008/10 - National Report on Adults, Youth and Children living in First Nations Communities" (PDF). fnigc.ca. Ottawa: First Nations Information Governance Centre. 2012. Retrieved 31 August 2016. ↑ Reimer, Gwen (2010). "The Indian Residential Schools Settlement Agreement 's Common Experience Payment and Healing: A Qualitative Study Exploring Impacts on Recipients" (PDF). Aboriginal Healing Foundation. Retrieved 31 August 2016. ↑ Wesley-Esquimaux, Cynthia C.; Smolewski, Magdalena (2004). "Historic Trauma and Aboriginal Healing" (PDF). The Aboriginal Healing Foundation. Retrieved 12 July 2016. ↑ Stolen children: truth and reconciliation. Dir. Canadian Broadcasting Corporation Toronto: CBC Learning, 2010. DVD. ↑ "Canada must confront 'cultural genocide' of residential schools, Truth and Reconciliation report says". CBC. 2 June 2015. Retrieved 31 August 2016. "A Lost Heritage: Canada's Residential Schools". CBC. CBC Digital Archives. Retrieved 31 August 2016. "Reports". National Centre for Truth and Reconciliation. Retrieved 11 July 2016. "The Legacy of the Residential School System in Canada: A Selective Bibliography (August 2009)". Library and Archives Canada. Retrieved 31 August 2016. "Educational Resources". umanitoba.ca. National Research Centre for Truth and Reconciliation. Retrieved 31 August 2016.